Two daddies came to cook!! What a delicious snack we had in the Bees' Classroom! 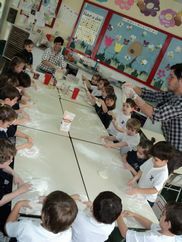 We invited Nacho, Lucia's daddy and Fernando, Malena's daddy to cook with us and they decided to make pizza!! What fun! They mixed all the ingredients in a bowl and each one of the bees helped to mix or add ingredients to be able to get the big ball of dough. Each bee then got a small ball to press and knead until it had a round shape to be able to put on the trays, add tomato sauce, cheese and take them to the oven. While the pizzas were in the oven, we went to the playground and when we came back, our delicious pízzas were waiting for us!! Thank you Nacho and Fernando for sharing your time with us and cooking delicious pizzas!! There are more photos of our cooking in the Photo Gallery.